Soho House group is not only cool but also very clever at seduction with its chic, popular and good-value hotels and restaurants. It was successful with Boheme Kitchen & Bar in Soho, but not successful enough it seems. Now the group has opened Soho Diner on the former Boheme site, inspired by Au Cheval restaurant in Chicago. Expect the likes of simple raw veg and dips, honey fried chicken, salads, hot dogs, burgers and a Philly cheesesteak sandwich along with shakes and banana splits. It's open for all-day brunch at the weekends and has cocktails ‘on tap.' Mon.-Wed. 11.30am-1am, Thurs.-Sat. 11.30am-3am, Sun. 11am-midnight. Soho Diner, 19-21 Old Compton St., London W1, 020-7734 5656. Richard Caring of Caprice Holdings, who owns such top London venues as Scott's, J. Sheekey and The Ivy, is spreading his wings. Beak Street will be the location for Grillshack. On two floors, the grill will be the main attraction, turning out burgers, steaks, roast chicken, salads and side dishes to eat in or take out. It's due to open at the beginning of September. Grillshack, 61-63 Beak St., London W1, no phone. Five Guys is another U.S. import into an already crowded burger market. On Covent Garden in a prime corner site, it's proving a hit with tourists, though the London crowd seems averse to the queue to order and fight for a table. Five Guys is well known in the U.S. for its mix-and-match burgers with fries, different toppings and sauces. And to wash it down? Coca-Cola, which is proudly served. Daily 11.30am-11pm. Five Guys, 1-3 Long Acre, London WC2, 0800 0833 005. It's becoming the battle of the burgers in London. Recently opened Shake Shack in Covent Garden's covered market building offers burgers, flat-top dogs and concretes --- aptly named dense frozen custard ice cream blended with tastes like chocolate, brownies, fudge, chocolate chunks and sea salt --- all in one glorious go. But take note: the ingredients are from some of the top suppliers, like paul.a.young chocolate maker. Wash it all down with sodas, root beers, wine and ShackMeister ales. Oh, and take your dog for its ‘Pooch-ini,' red velvet dog biscuits with peanut butter sauce and vanilla custard. Mon.-Sat. 11am-11pm, Sun. 11am-10.30pm. 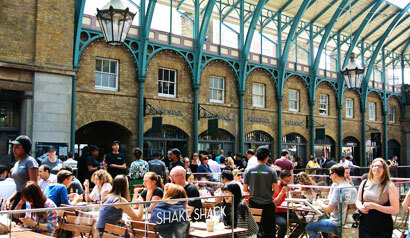 Shake Shack, The Piazza, 24 Market Building, London WC2, 020-3598 1360. Dishoom in Covent Garden proved an instant favorite with its old Delhi meets new Bollywood style. So now a new Dishoom has opened in Boundary Street, just a hop, skip and jump from Sir Terence Conran's popular Boundary hotel and its caff, Albion. The new Bombay café offers small plates for sharing in a series of spaces, which include a courtyard for al fresco dining. Daily 9am-11pm. Dishoom, 7 Boundary St., London E2, 020-7420 9324. Duck Soup in Soho was started by three ex Mark Hix chefs. Its instant success has spawned Rawduck in Hackney Central. It bills itself as a coffee shop and natural wine bar and with its concrete bar, huge blackboards and laidback atmosphere appeals to the local residents. It's a café until noon, then an elevated casual lunch place with creative sandwiches and small plates on offer. Mon.-Sat. 8am-10.30pm, Sun. 10am-10.30pm. Rawduck, 5 Amhurst Rd., London E8, 020-8986 6534. Names get odder and odder on the London restaurant scene, but then so do concepts, design, ideas and dishes. Flesh & Buns is the second venture from Australian chef Ross Shonhan, who opened Bone Daddies in November 2012. The new venture in Covent Garden plays with mismatched furniture, rock music, odd graphics and art that fill the basement dining room where steamed 'hirata buns' are served with 'flesh' fillings --- bingo, there's the connection. Along with robata-grilled fish and meat, there's also sashimi and small dishes like crab, avocado and cucumber rolls and irresistible desserts such as donuts with black sugar custard. Lunch & Dinner Mon.-Fri., Sat. noon-11.30pm, Sun. noon-9.30pm. Flesh & Buns, 41 Earlham St., London WC2, 020-7632 9500. Navajo Joe in Covent Garden has become Joe's Southern Kitchen & Bar. Still part of the successful Maxwell group, this is the latest place to go for Southern American cuisine, from smoky ‘beer can' chicken carved at your table to good-size burgers. Spread out over three floors of a converted warehouse, it's a rocking, casual place with exposed brick walls and decorated with old-style Americana like vintage Coca Cola signs and steel-topped tables. Joe's Bar downstairs plays rockabilly, blues and country that you can listen to with the help of some pretty good bourbons and rums. Joe’s Southern Kitchen & Bar, 34 King St., London WC2, 020-7240 4008.